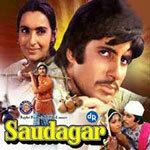 "Saudagar" is a 1973 hindi film which has Amitabh Bachchan, Nutan, Padma Khanna, Trilok Kapoor, Murad, Dev Kishan, Leela Mishra, Jugnu, V Gopal and C S Dube in lead roles. We have 4 songs lyrics and 4 video songs of Saudagar. Ravindra Jain has composed its music. Asha Bhosle, Manna Dey, Kishore Kumar and Lata Mangeshkar have sung these songs while Ravindra Jain has penned its lyrics.